I cooked a big pot of spaghetti sauce last Sunday. It’s the clone’s (my youngest daughter) favorite, so even though the rest of us aren’t that crazy about spaghetti, we have to have it at least every other week so the clone is happy. She has been eating spaghetti almost everyday, either for lunch or dinner, so all the spaghetti is gone, and all we have is one more tupperware container full of sauce. I came home for lunch today, made myself this. 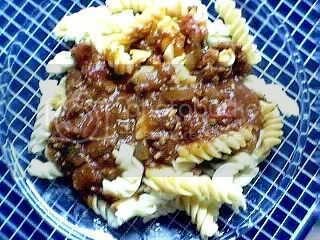 Rotini pasta with spaghetti sauce. My recipe for this sauce changes all the time, it just depends on what I have on hand. This is the simplest version, without any additional vegetables or meats. Brown the ground beef and drain the excess fat. Sautee with garlic and onions until onions are translucent, and add the dried oregano. Add the chopped tomatoes and tomato sauce. Season with salt and pepper as needed. Add half of the fresh basil and simmer for about 1 hour, stirring occasionally. You can simmer longer if it seems too ‘loose’ or watery, 1 hour simmering is minimum. Fresh tomatoes can get quite watery, but the flavor is sweeter. No need to add sugar here. Ten minutes before turning off the heat, stir in the rest of the fresh basil. Serve with your choice of pasta.